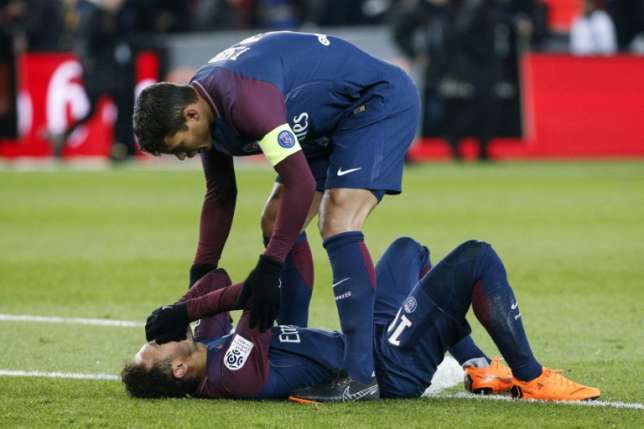 Neymar was worryingly stretchered off with an ankle injury on Sunday, marring Paris Saint-Germain's 3-0 victory over Marseille that increased their Ligue 1 lead to 14 points. Just 10 days before the French leaders' Champions League last 16, second leg against Real Madrid, there was concern over the world's most expensive player as Neymar was carried off 10 minutes from time. He was holding his head in his hands as he was taken off. It was an otherwise easy night for the big-spending Parisians as teenager Kylian Mbappe became the youngest scorer in the French 'Classique'. Uruguayan goal-machine Edinson Cavani was also on the scoresheet while Neymar had a hand in PSG's other goal. With Monaco drawing 3-3 at Toulouse on Saturday and Lyon held 1-1 at home to local rivals Saint-Etienne earlier on Sunday, it meant none of PSG's three nearest challengers managed to win. This result was never in doubt and PSG coach Unai Emery even had the luxury of bringing off Mbappe, 19, after an hour to give Argentine international Angel Di Maria a half-hour run out -- Emery may now be wishing he'd chosen to rest Neymar. Former Aston Villa full-back Jordan Amavi was in place to intercept the ball but he slipped and succeeded only helping it onto teenage star Mbappe, who jinked inside onto his left foot and dragged a low shot inside Yohann Pele's near post. Layvin Kurzawa slipped Rabiot into the inside left channel in the visitors' box and he picked out Brazilian Neymar with a cut-back. The forward's poked finish was heading off target until his compatriot and Marseille centre-back Rolando thrust out a boot and inadvertently directed the ball into the goal. Ten minutes before half time and the men in blue were already breaking out the showboating tricks and flicks, with Rabiot's backheel setting up Neymar to curl a long-range strike just past the post. Marseille barely had a sniff and when midfielder Andre Anguissa got up to meet a header in the box, it looped up harmlessly and landed in goalkeeper Alphonse Areola's arms. Marseille were barely putting up a fight, but substitute Clinton N'Jie managed to get himself booked for needlessly lashing out at Marquinhos and then clashing with Dani Alves, who also saw yellow. After Neymar was stretchered off, the pacey N'Jie almost gave Marseille hope but having rounded Areola, his goal-bound effort was cleared off the line by sliding PSG captain Thiago Silva. Areola also made smart saves to deny Florian Thauvin and Luiz Gustavo, but Marseille's spirited finish had come too late.